leep has never really been a top priority for me. A few more cups of coffee, cat nap here and there, and getting by on five hours or so has been the norm for a very long time. Since I was 17 I've never really had a real bed. It's been a futon on the floor, pull-out couch, whatever. And then it dawned on me that having a grown-up bed is just...well, grown up. It was time to do this. 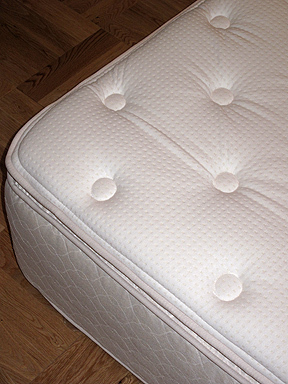 Shopping for a mattress has to be the most time consuming and yet useless endeavor on the planet. Choices range from actual Japanese futons (purportedly amazing) to springs/coils to memory foam to latex to various inflatable options. Price ranges from $400 to $10,000+. Hoards of advice, and then contradictions to that advice. Scams abound. Enough technical diagrams and cutaway photos to bore you into oblivion. Time for a new strategy - one that didn't require me to see the mattress, lie on it, and yet trust that it is what it is. Enter Four Seasons Hotels. I read that Four Seasons Hotels and Resorts, a luxury hotel company, is selling their proprietary designed mattresses (built by Sterns & Foster, a division of Sealy) to the consumer public. I've been to a couple Four Seasons hotels and resorts. I slept fine. It's a reputable company. 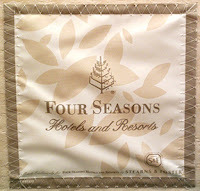 Have you ever heard from someone that they had a nice time at the Four Seasons, except that the bed was uncomfortable? I haven't. And then the more I thought, the more I realized their challenge. Their beds need to be universally comfortable for a wide array of clientele. They don't want to replace them frequently, so it needs to last a long time. The only way to order them is directly through the hotel. Problem solved. They say to allow four to six weeks for delivery. Mine showed up in three weeks. You can order the mattress, the box spring, a frame, and even sheets through them. The prices were reasonable - well within budget. I just ordered the mattress. It's thicker than most at 15 and a half inches. It has over 500 coils and a super-plush pillowtop. And comfort? Absolutely unsurpassed. Contact the Four Seasons Hotel nearest you for pricing and details. Hello Bouge Boy, my name is Scott and I am a representative for DUXIANA and I’d like to thank you for posting your concerns about The DUX Bed in June earlier this year. I know that it’s been over 4 months since your post and we feel bad that it has taken until now to get back to you. We are hoping to give you the opportunity to see and try a DUX Bed for yourself so that you can post a more comprehensive review based on your own experience. Our Downtown NYC store has a sleep chamber where a customer can have 4 hours of uninterrupted, private time to try out the bed. Please contact the store directly to set up a time to experience a DUX Bed for yourself! Feel free to contact me directly if you have any questions at duxiana.representative@gmail.com. Thanks again.